You are here: Home>Contribute>Searching for....>Can anyone help identify this Herts Police Officer ? This photo was in an album my grandmother had. She grew up in Bishop’s Stortford but I don’t remember her ever telling me who this man was. 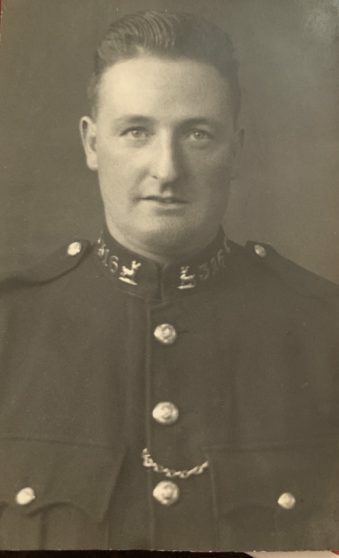 Can anyone provide any information, maybe based on the uniform / collar number ? This page was added on 16/03/2019. I cannot be absolutely certain as I am going from memory, but when I was a police cadet at Watford in 1958, there was a Sergeant stationed there whose name was Stuart Jackson and I am fairly sure that his number was 316. Does the name Jackson ring any bells with the enquirer ? Also, is it possible that the officer may have been a lodger with the family, as it was common practice for single officers to live in ‘digs’ at private houses, as indeed I did myself in the early days of my service.